This Tuesday Druids and pagans converge on the windswept English plains of Wiltshire to observe the annual rites of autumn. The occasion is the equinox, when the tilt of Earth’s axis is suspended between 12 hours of night and 12 hours of daylight. Mabon marks the middle of harvest, it is a time of equal day and equal night, and for the moment nature is in balance. It is a time to reap what you have sown, of giving thanks for the harvest and the bounty the Earth provides. For finishing up old projects and plans and planting the seeds for new enterprises or a change in lifestyle. Mabon is a time of celebration and balance. Each year in December visitors from around the world gather at Stonehenge early in the morning to mark the Winter solstice and to see the sunrise above the stones. The sunrise on the 22nd of December at 8.04am. We will be there for sunrise! 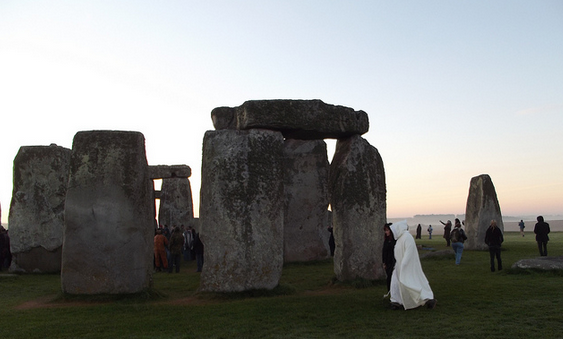 The Winter Solstice is the most important day of the year at Stonehenge and a truly magical time to be there. It’s an ad hoc celebration that brings together England’s New Age Tribes (neo-druids, neo-pagans, Wiccans) with ordinary families, tourists, travellers and party people – 100’s of them!